In case you missed it, FALL is officially here! 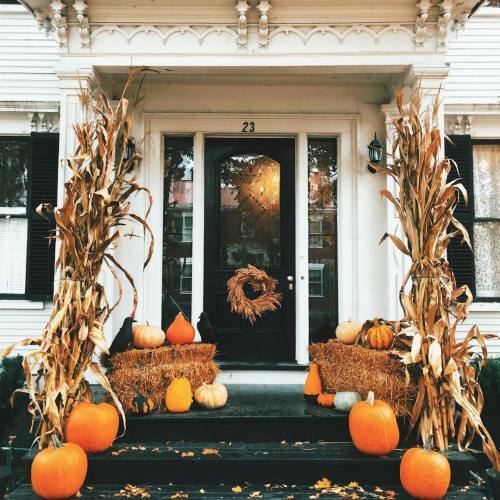 Are you about to head to your local pumpkin lot to select a beautiful array of pumpkins to decorate your home? I am! There’s no better way to say, “welcome to my home,” than with an inviting Fall themed front door or porch. 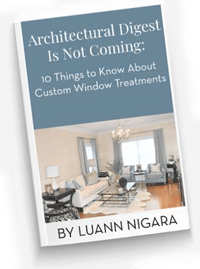 You may have already started to see stunning arrangements in magazines, online pictures (Pinterest no doubt) and perhaps even your neighbor has it together. Now it’s your turn. 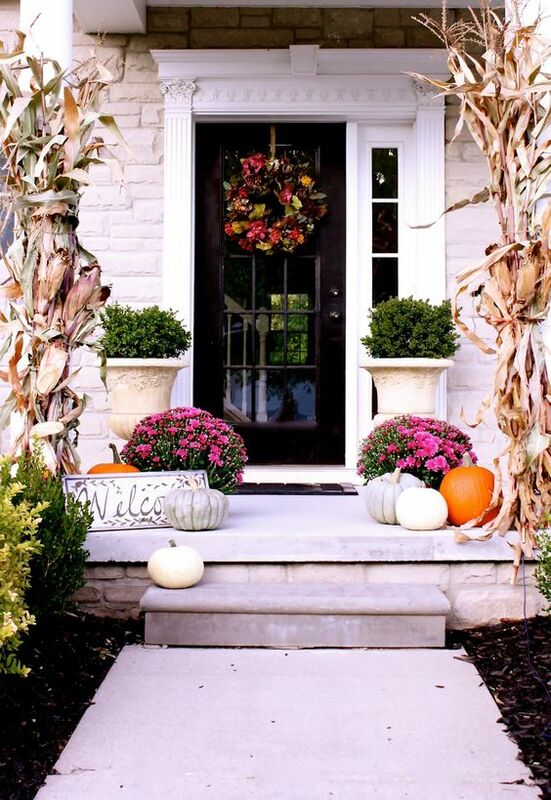 Let’s break down the elements that make up a well-designed Fall front entrance. There are three elements I like to stick to: COLOR, SCALE & TEXTURE. 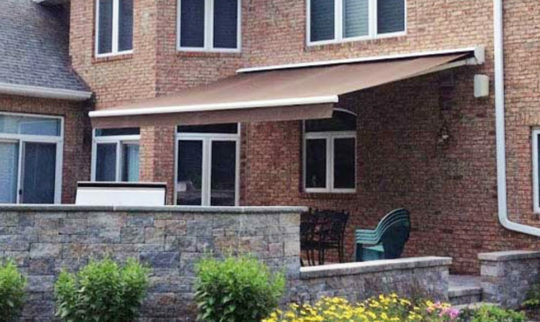 Good design, be it indoor or outdoor, starts with a thoughtful color palette. Decide whether or not you want to go the traditional orange, yellow and red route. Do you want to have a monochromatic theme? Or do you want to infuse some of summer’s more vibrant colors with traditional Fall colors? Select a color combo and start building from there. Scale is important when arranging your entrance. Take advantage of outdoor furniture such us benches, side tables and even the steps. If your walkway or path is flat, create varying levels with planters, bales of hay and lanterns. You want the eye to move around and not be fixated on any one area, instead taking in the entire space. 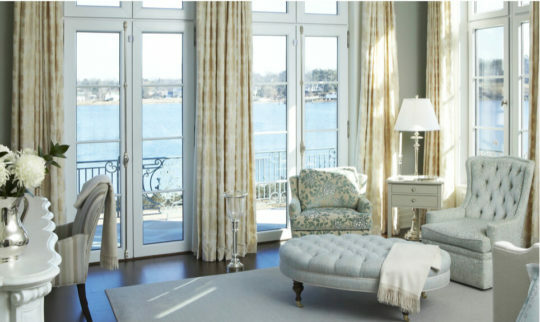 Selecting decor items that vary in size: small/big, tall/short will achieve this. The spirit of Fall encourages us to get tactile. 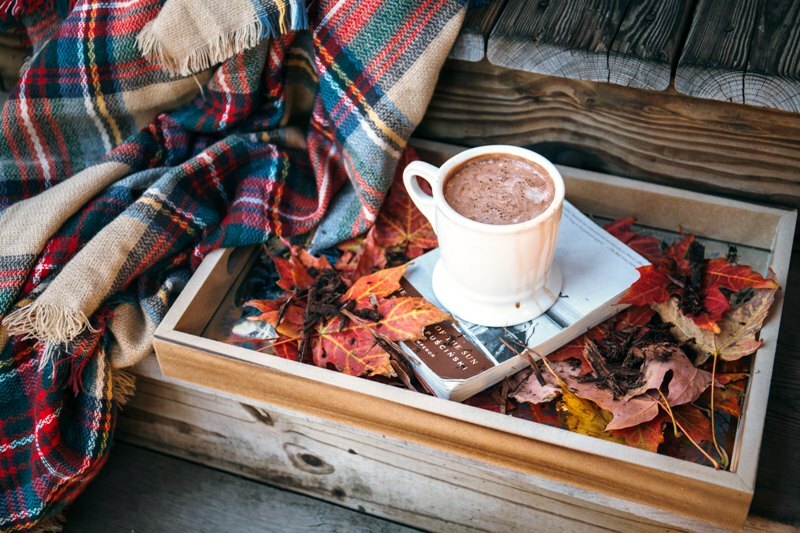 From picking and carving pumpkins, touching the fallen leaves, grabbing your bale of hay to holding and sipping your cup of hot coco. Its all about touch. With touch comes various textures. Your entrance should feel lush and look tactile. 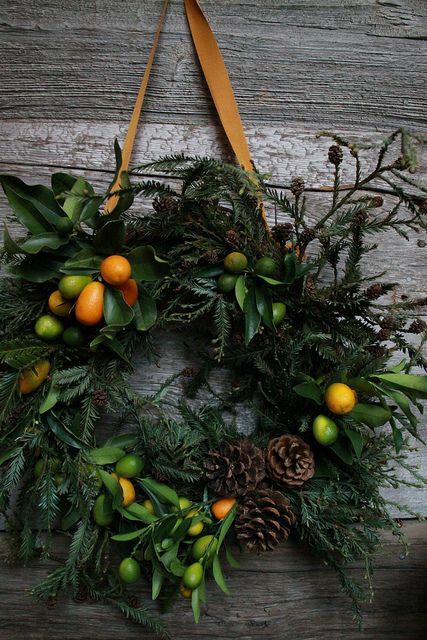 Incorporate wreaths, stacks of shucked corn, bales of hay and, of course, pumpkins. Don’t forget to mix in gourds, which add depth and visual interest since they come in unique colors and funky shapes. This also includes using materials such as wood barrels, ceramic jugs and metal planters. Explore wreaths created with different material such as yarn, succulents (not just for Summer), cotton stems and felt. 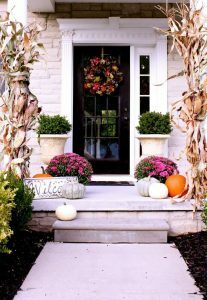 Here are a few of my favorite Fall wreaths. Be creative and use unexpected materials to style a beautiful, thoughtful front entrance. 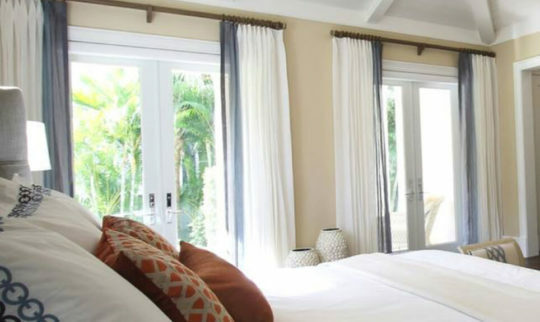 Next we’ll talk about how to elevate the coziness indoors with window treatments, area rugs and throw blankets. Get ready to snuggle up! 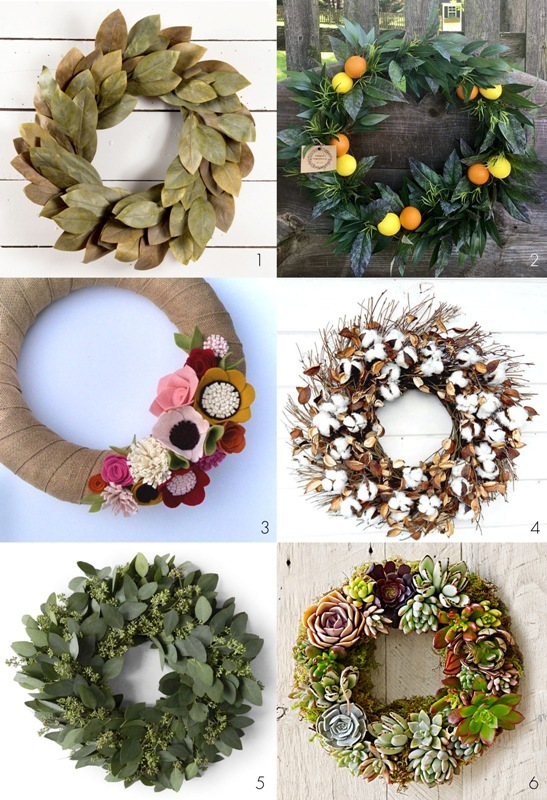 Interested in one of the above wreaths? Each of the wreaths pictured above are numbered and here are the coordinating links for product purchase. Just click on the wreath you are interested in.